Kubrat Pulev has counter-attacked female reporter Jenny Sushe after she sought to get his boxing license suspended. Long story short, Pulev forcibly kissed Sushe on the lips during their interview; the latter consequently claimed he also groped her as she decided to sue him. The Bulgarian boxer, however, has now claimed that Sushe looked happy when he kissed her, and that she’s accentuating the incident to make money out of it. “I judged that the person opposite me didn’t just want a kiss, but much more,” he told reporters. What more? He went to the extent of saying many women have the desire to lock lips with him, and that Sushe should be grateful she was the ‘lucky one’. He also claimed that she could be doing so to make a handsome amount out of the incident or to garner more publicity for her publication, Vegas Sports Daily. Anything else? Well, make a good observer watch the video, he claims, and they’ll observe that she had fun, smiled, and even thanked him. 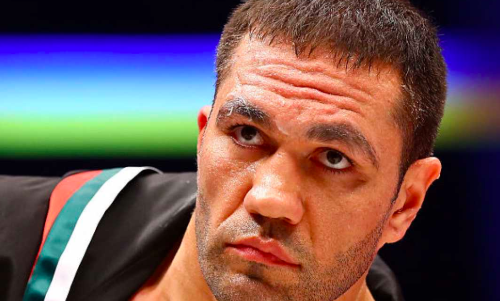 Pulev, who improved to 27-1 after stopping Bogdan Dinu last week, has lost only once in his professional career (to Wladimir Klitschko). His future hangs in jeopardy though.